We will be walking through how to plug in and add your own features to the world generation code of Vintage Story by looking at a demo mod called VSTreasureChest. The full source code for this project can be found on Github. We are going to walk through coding it from scratch. This mod places treasure chests around the world for the user to find. Each treasure chest has a random number of ingots in them. 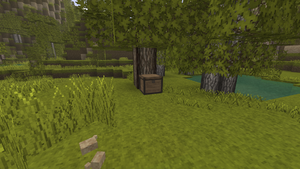 The mod only places treasure chests beside trees. It also adds a server command that can be run in the chat window called /treasure that places a treasure chest in front of the player. This can be useful for testing in case you want to change what items are in the chest and you don't want to bother looking for the chest for verification. Please follow the instructions here for setting up your development environment. We named our project VSTreasureChest but you can choose any name you like. We will do one different thing. When you get to the debug command line arguments instead of passing /flatworld we are going to pass /stdworld:test. The reason we are doing this is because we are going to be placing our chest beside a tree. The /flatworld generates a flat world with no trees so that won't help us much in this scenario. However, depending on the specific terrain gen features you are doing you may want to use /flatworld in the future. The main class and the starting point of our mod will be VSTreasureChestMod. The first thing to note is the using directives at the top. Those that start with Vintagestory will allow us to access classes in the Vintagestory api. Next the StartServerSide is a method we are overriding from ModBase that is called once when the server is start up. Here we start by just storing a reference to the ICoreServerAPI for convenient access later. We will also be registering call backs for other events here. We also override ShouldLoad to tell the system to only load this on the server side and not the client side. It would work without this but it's not necessary for the client to load this mod since all our code happens server side. Next we are going to add the /treasure command. To do this we must register a delegate so that we can be notified when the user types our command. We do this with the ICoreServerAPI.RegisterCommand method. This is registering a treasure command with the server with a brief description that is used to describe the command for when the user types /help. The other important argument is the PlaceTreasureChestInFrontOfPlayer argument which is a reference to a method we haven't written yet. So lets add the following method below StartServerSide. This method will now be called when the user types /treasure command in the chat window. Wasn't that easy!!! Now we need to write the code to place our chest in that method. The first thing we need to do is figure out how to tell the API that we want a chest and not grass or stone or some other block. Every Block has a numerical ID that gets assigned when the server starts but this ID may change. Luckily there is a property of the Block class that identifies it and does not change. This is the Code property. Block codes can be found in Vintagestory\assets\blocktypes in json files. The one for chest is Vintagestory\assets\blocktypes\wood\generic\chest.json. If you open that file you will see at the very top the code property is set to "chest". We also need to append the type of the shape that basically tells the system which way the chest is facing. So for simplicity we are going to pick south. So the resulting block code we will be using is "chest-south". Ok lets see some code. The first line of code asks the IWorldManagerAPI to get the numeric block id for the block code "chest-south". Next we get the Block class that represents that chest. And finally we call a method called TryPlaceBlockForWorldGen and pass in an IBlockAccessor. There are many implementations of IBlockAccessor and we will cover that in a little more detail later. For now we are using this one. The second argument just calculates the world coordinates for 2 blocks in front of the player. Now if you run the mod from Visual Studio by pressing "Start" at the top you should be able to execute the /treasure command in the game. Once you do that you will have a fancy new chest appear in front of you with no items. Well I guess it's time for us to add some items. We want to add some items to the chest since after all it is a "treasure" chest. For now we are going to add various ingots to the chest. However there are lots of items in Vintagestory and I encourage you to play with this and feel free to add other items. We also want to add items at random. Not only the type of items should be random but also the ingots we add should be random. There are all kinds of ways to do this but lets write a data structure that represents a grab bag full of items and lets pull items out of that bag and place them in the chest like Santa Claus! We will create a ShuffleBag class so in Visual Studio right click on your project and go to Add->Class. Call it ShuffleBag.cs and press Add. Here's the code to place in the ShuffleBag class. This is all basic C# stuff but the idea is that we are going to call Add on our ShuffleBag several times to load it up, then we are going to call Next to pull items out of it. This will let us kind of control the probability or rarity of items placed in chests. Items that are more rare will have fewer items in the bag. Lets add a couple of class variables to control the minimum and maximum number of items that will go in our chest. Since we will want to create a new ShuffleBag with each chest we place lets go ahead and create a MakeShuffleBag method. This loads up our ShuffleBag with various ingots. The only more common item is iron. Feel free to change the item counts as you see fit. One thing to note here is the API does give us an instance of Random that we can use so we pass it in to our ShuffleBag. We are almost ready to place these items in the chest but we need to create an ItemStack for each slot we will be taking up in the chest. The chest is an instance of IBlockEntityContainer which has an Inventory property. An Inventory is made up of several IItemSlot instances. We need a utility method to create a list of ItemStacks to place in those slots. Here we make our ShuffleBag by calling MakeShuffleBag. We calculate a grabCount which is random number between MIN_ITEMS and MAX_ITEMS that controls the number of times Santa is going to reach into his bag. We don't want to create an ItemStack for each item because we may get 3 iron ingots for example. We don't want 3 slots with one iron ingot, we want one slot with 3 iron ingots. So we create a Dictionary and add items of the same type to the same ItemStack. This method returns an IEnumerable that we can loop over so we need to add a method that can loop over a list of ItemStacks and add them to our chest. This method does just that. It advances the IItemSlot number each time, ensuring not to place more ItemStacks than there are IItemSlots, and sets the IItemSlot.ItemStack value to the current ItemStack in the loop. We are almost there! We have all the pieces. Now we just need to get a reference to our chest that we have already placed and pass it to this method along with the ItemStacks. Lets go back to our PlaceTreasureChest method and replace the last line with the following code snippet. The first line is just capturing the BlockPos position object so that we can use it in two places. The next is the same as before, just placing the chest in the world. Next we go back to the IBlockAccessor to get the block entity at that position. It's important to call GetBlockEntity here because a chest is an Entity. An Entity is something that has extra behavior attached to it as opposed to a normal block. This method returns an IBlockEntity which is a generic interface for all block entities. However we specifically need a block entity that has an Inventory. Since we know the block entity we just placed is a chest then it's safe to to cast the returned IBlockEntity to an IBlockEntityContainer which is a specialized version of IBlockEntity that provides access to an Inventory. Now that we have that we pass it along to our AddItemStacks method we created earlier and additionally pass in the list of ItemStacks that are created by our MakeItemStacks method that we also created earlier. Now if you run the code again and type /treasure you should have random items in there! Try it several times and you will see them change. That's really cool and all but not real fun for a game play experience. We want the player to find these chests and encourage them to explore the world! So lets plug in to world gen next! Hooking into the world gen api is very similar to how we registered our command. We will pass a delegate callback that gets called when a chunk column is generated. The first argument is a delegate, which is a reference to a method. You will get a compiler error after adding that line because we have not yet created the OnChunkColumnGeneration method. We will create that next. The second argument is an Enum that indicates which world generation pass we need to hook into. Vintage story uses several passes to generate the world. Different features are available during different world gen passes. Since we will be placing chests next to trees, we need trees to be in the world so we choose to be notified during the EnumWorldGenPass.Vegetation which tells the engine that we need neighbor chunks, block layers, tall grass, bushes and trees to be available. The above code is our empty OnChunkColumnGeneration which will be called when a chunk is generated. Now we need to look at how to place blocks in this method. We have already seen the IBlockAccessor interface and we will be using that to place our blocks but we can't use the implementation we used before. In the next section we will see how to get the IBlockAccessor we need and use it to place our chest. The server does not generate chunks on the main game thread because the game's frame rate would drop significantly and it would really be disruptive to game play. The server spawns a separate thread for this and there is a special IBlockAccessor that is used in that thread that we need to get a reference to in order to place our chest. First lets add two variables at the top of our class of type IBlockAccessor. One to hold our game thread IBlockAccessor and one to hold the one used by the server world gen thread. Let's initialize worldBlockAccessor at the top of StartServerSide. This is the IBlockAccessor we used in our /treasure command. Later we will refactor that code to use this variable. Next we will register a call back delegate to be passed the IBlockAccessor we need. Place this in StartServerSide. Let's do a quick refactoring before we move on. Remember our PlaceTreasureChestInFrontOfPlayer method? The code in that to place the chest is going to be reused by our world gen code but we won't have a player in that case and we will also need to use a different IBlockAccessor to place our block. So let's refactor that to use a new method we call PlaceTreasureChest. So replace PlaceTreasureChestInFrontOfPlayer with the following. So what we did is make a PlaceTreasureChest that takes an IBlockAccessor and a BlockPos for placing the chest. The null check on chestEntity is probably not necessary however while developing this I found I was misusing the API by using the wrong IBlockAccessor so the null check helps detect this scenario and provides a more meaningful message than just a NullReferenceException so I suggest leaving this in. Also notice that we are printing a message to the console when a chest is placed. This is also optional however it's helpful for finding chests in the world when testing. Our PlaceTreasureChestInFrontOfPlayer method now calls our new method passing it the appropriate IBlockAccessor and the BlockPos 2 blocks in front of the player. Now that this refactoring has been done, we are ready to find a suitable spot to place our chests. Now we are ready to place code in our OnChunkColumnGeneration to find a suitable spot for our chest. We are going to set up a nested for loop to loop through each x,y,z location in the chunk and see if that spot is beside a tree. Before we set up our loop we are going to add a few more variables at the top of our class. Make sure to add this after you set worldBlockAccessor! I'll explain the treeTypes variable in a bit. Just add it for now. We've added a couple of methods here that I'll explain first. The ShouldPlaceChest method simply generates a random number between 0 and 100. If the number is between 0 and our CHEST_SPAWN_PROBABILITY multiplied by 100 then it returns true. This is called before we do our loop to see whether we should proceed in placing our chest. We will fill in the details of TryGetChestLocation in the next section so just leave it for now. The loop goes through each x, z then y coordinate and converts the coordinates to world coordinates by multiplying the chunkX coordinate by the chunkSize and adding our x coordinate in the loop. The same goes for Z. This is very important! Our IBlockAccessor expects world coordinates. World coordinates start at the beginning of the world whereas chunk coordinates start at the beginning of the chunk. Always keep your coordinate system in mind. Another thing to note here is that BlockPos is created outside our loop and reused to cut down on object creation. You don't want to create a ton of objects and cause garbage collection because this will negatively impact performance. Try to create as few objects as you can in code that will be executed frequently. The meat of the code calls our TryGetChestLocation to get a BlockPos. If the method returns null that means the current x,y,z is not a suitable location. However if it is then it moves on to our PlaceTreasureChest and increments the chestsPlaced counter which is used to check and make sure we aren't placing more chests in the chunk than MAX_CHESTS_PER_CHUNK. Our loop and main logic is finished. Now it's time to implement TryGetChestLocation to detect trees. Remember the treeTypes variable we created at the top of our class? Now it's time to populate that with the block codes of the tree logs we will be looking for. Let's add a method called LoadTreeTypes. There are some improvements that could be made to this algorithm. I list them in the Exercises below. However, now you should be able to run the code and find treasure chests in your world!! You should now have an idea of how to register commands and place blocks during world gen. There's plenty more to explore. If you want to take this code further please see the suggested exercises below. A few things could be done to improve this code and it's left as an exercise for the reader. Doing this will help you get familiar with the API without overwhelming you. Currently the code will place chests over water or air. Change TryGetChestLocation to only place chests over solid blocks. Make the chest face away from the tree log(and player) correctly. Currently it always faces south. Hint: use chest-north, chest-east, chest-west. Make chests a more rare item to find. Chests should have more interesting items. Modify the code to put some more useful things in there. Maybe tools or weapons that can't be crafted. A harder exercise might be to only place chests in caves. This page was last modified on 7 January 2019, at 14:18.